To compare prices of your countertop materials such as granite, quartz, quartzite or marble, you will have to provide us with the approximate size of your countertop space. You will have to measure your countertop yourself, or draw your own drawing but do not worry it’s very easy. How to get approximate sizes….. All you need to do is measure the length of your countertop and the width. If you have a backsplash same thing measure length and width. Step 1: Measure the length of the countertop by measuring along the wall from one edge to the other. 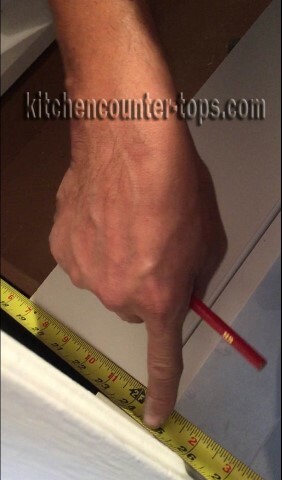 Step 2: Measure the width of the countertops by measuring from back wall to the front edge of the countertop. Be sure to include the thickness. Then if you would like to go a little further and make out the drawing follow the next step. How to draw your own plan ….. No need to for it to be fancy. Draw out your countertop to get a free quote. All you need is a piece of paper and a pencil, and if you want a ruler but that is optional. Draw out your countertop if it’s an L shape, U shape or straight pieces. On Each edge write the sizes either in inches or feet. Let us know if it’s an undermount, drop or farm sink. Mention what brand, color and thickness you would like (if you know) otherwise we can help with that later on. If you do get a cheaper quote we will do our best to meet your budget. We might not be the cheapest but we will be the best. The cheapest is not always the best to go for; you get what you pay for. We want our clients to be 100% satisfied and happy with their countertops.